Ah....it's been a few days! I am determined not to let my blog fall by the wayside...again. I have been getting a few things done though, so that's feeling pretty good. After a few posts and comments on facebook, I suppose I have to accept that it's possible that the personal blog is dead. Sigh. I hope that's not true but I fear it might be. I go to all kinds of blogs when I am searching for information - I love some them! I never really noticed if they were something that was sponsored, or had a lot of followers...I just know that there is a wealth of information out there and my hope is that maybe someday one of my posts will be of use to someone. At any rate, I find this is a good place to share what I have been working on and thus retain it for my own benefit. I'm not really a journal-keeping type of person, although I have tried in the past. Just not really my thing...although I love seeing other people's journals! My mom and I have been working on making little quilted things for MONTHS now. She loves to hand quilt. She has macular degeneration and so we all know that she will not be able to do this forever, but until that day comes, I am making every effort to provide her with little projects to work on. Some months ago we decided we wanted to try making a proper quilt - you know - for a bed or something! Revolutionary!!! 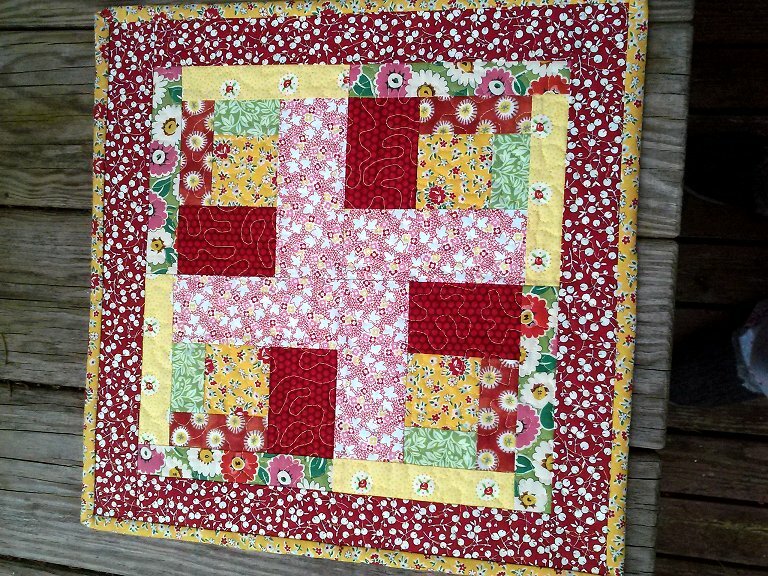 I had never pieced anything much, and because of my mom's eyesight she wanted to be able to quilt using no hoop or frame of any kind. She's had great success doing this with our small projects. And I can tell you that I wish I had known about spray basting MONTHS ago!!! I just bought some and lo and behold she LIKES it!! woot! I put on my Trouble_Shooting Hat (I wear this a lot). I promise to post pictures as I go - because...who knows who might benefit from my screw-ups?!?! this is a little quilted thing I made for my mom's table - in celebration of us finishing the most TEDIOUS embroidery project EVER. Really! 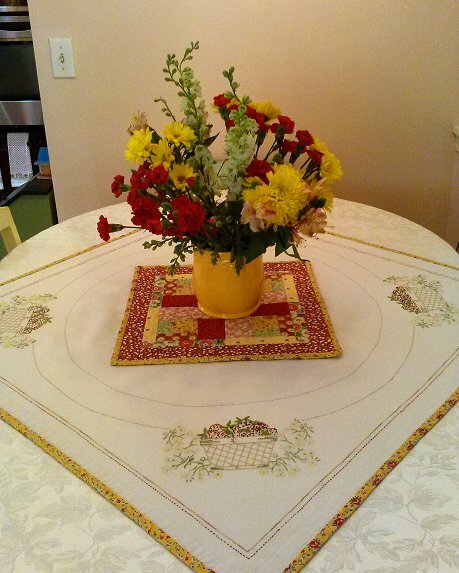 this was a tablecloth we put together some years ago (yes, years!) and it was so annoying to do, that we kept putting it away and would get it out on occasion and then put it away again. It was SO GRUBBY from being handled for...I don't even know how long...5 years? But while I was cleaning my studio she got it out and was determined to finish it. And she did! Well, I did a little bit of work on it, and I certainly helped by threading needle after needle for her, but really it was 90% her! Iput the little binding edge on there after it was done. OK - that's enough for now... I should go back and check this for typos but am too excited to share! maybe later! Hey Amy: Per Jen's recent blog post, I don't think blogging is dead! And I want to say, I love that little quilt. 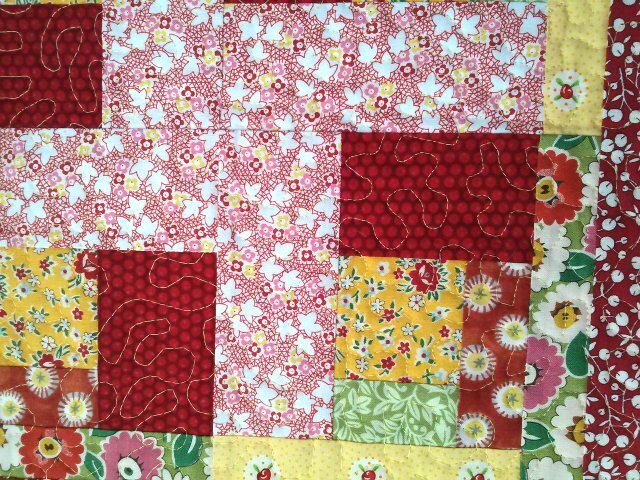 Do you have a quilting sewing machine? Or did you do that curvy stitching w/a regular machine?